Презентація за темою: "King Arthur - Король Артур". 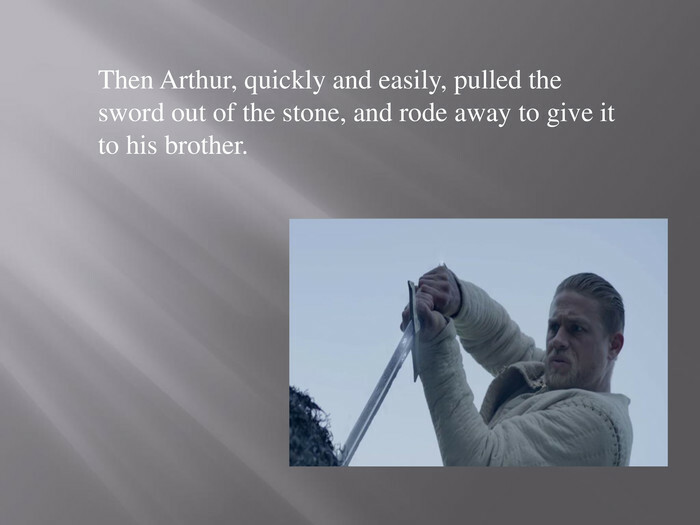 Презентація "King Arthur - Король Артур" . 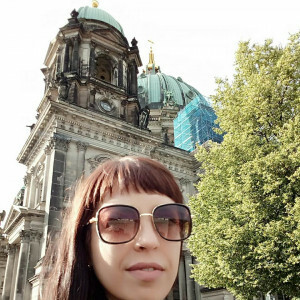 Підготувала Горлова Я.В. - викладач кваліфікаційної категорії «Спеціаліст І категорії» Маріупольського механіко-металургійного коледжу ДВНЗ «ПДТУ» - 2019 р. Сприяє активізації розумової діяльності студентів, підвищенню рівня знань студентів з іноземної мови, інтересу до дисципліни. Є корисною у процесі навчання та розкриття інтелектуального потенціалу студентів . 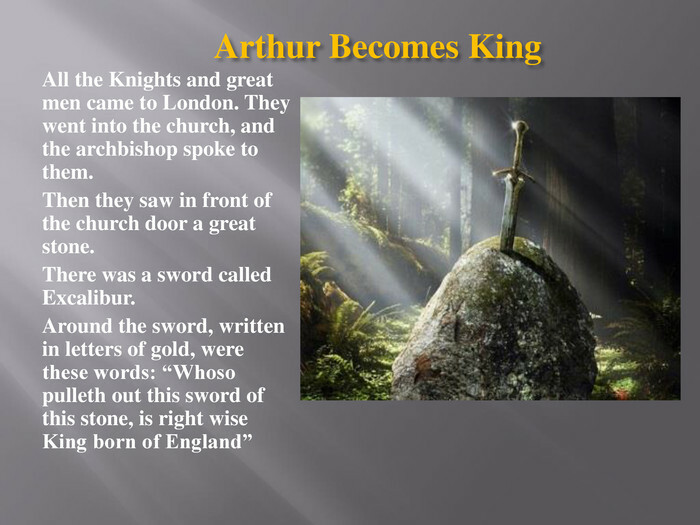 Arthur was a famous king of England. He lived such a long time ago that we know very little about him. 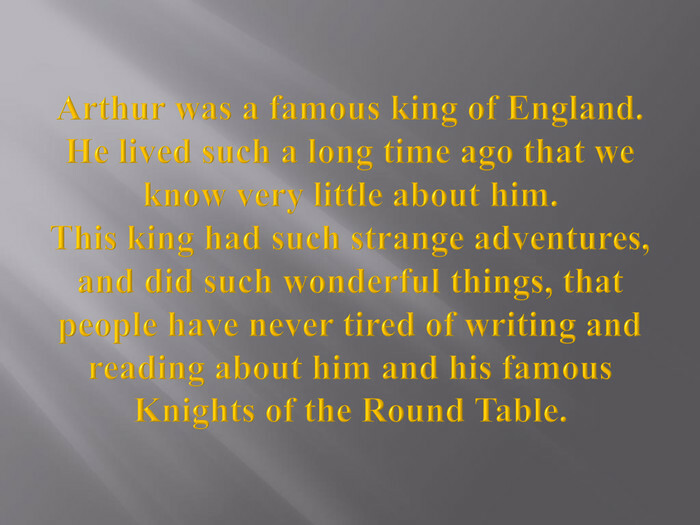 This king had such strange adventures, and did such wonderful things, that people have never tired of writing and reading about him and his famous Knights of the Round Table. 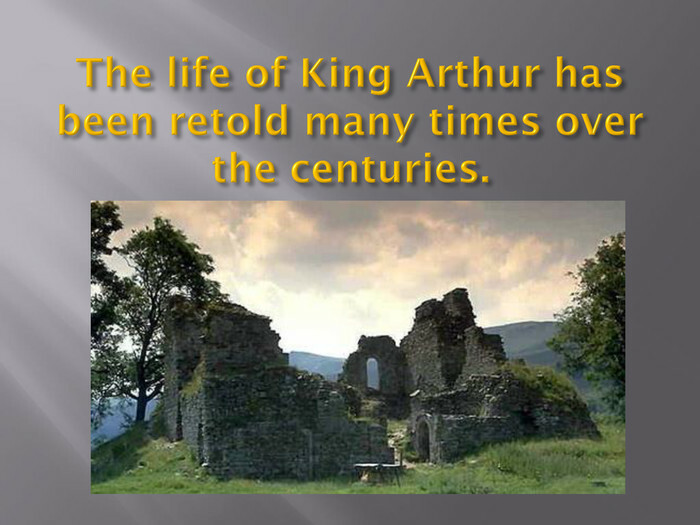 The life of King Arthur has been retold many times over the centuries. When a boy was three days old Merlin came to the door of the King’s house. It happened that the baby was given to Merlin, who was supposed to know all things as he was a magician. 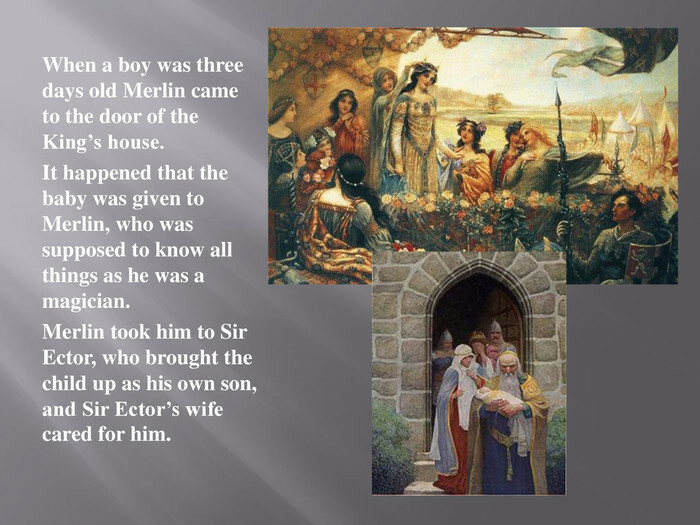 Merlin took him to Sir Ector, who brought the child up as his own son, and Sir Ector’s wife cared for him. 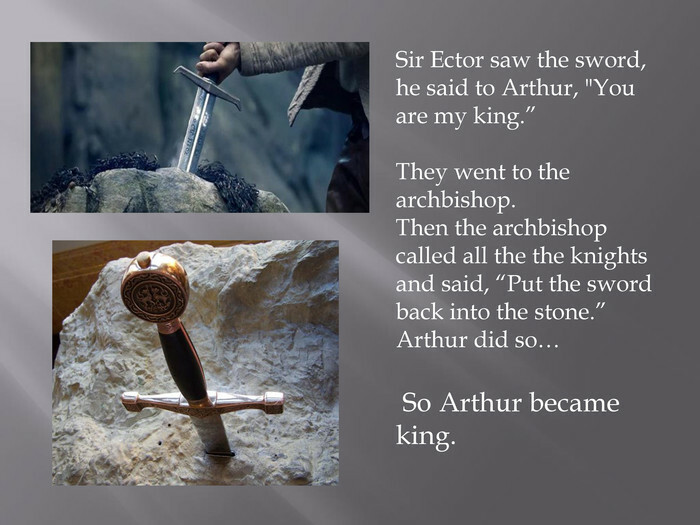 Arthur becomes King. 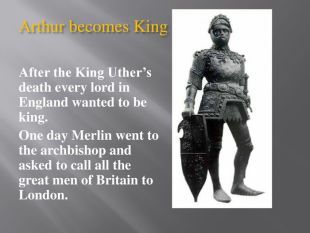 After the King Uther’s death every lord in England wanted to be king. 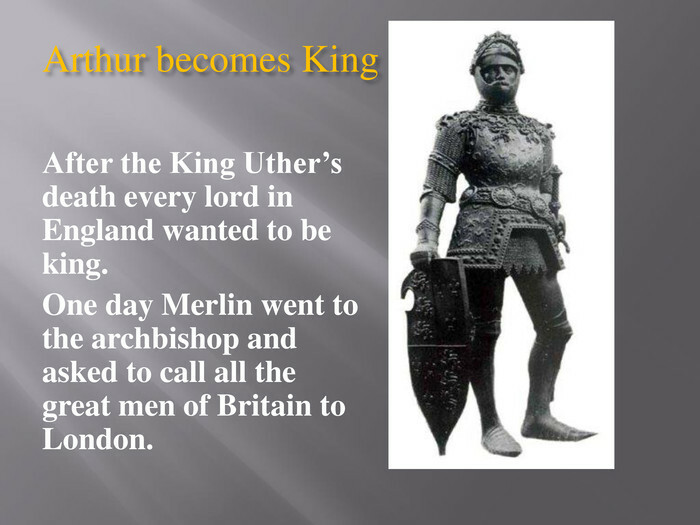 One day Merlin went to the archbishop and asked to call all the great men of Britain to London. 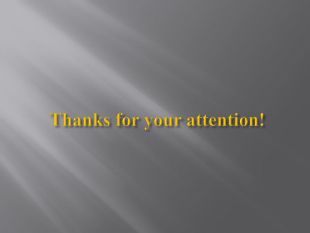 There was a great contest. All the barons came to the contest to try their skill. Among them rode Sir Ector, with him his son, Sir Kay, and his foster-son, young Arthur. 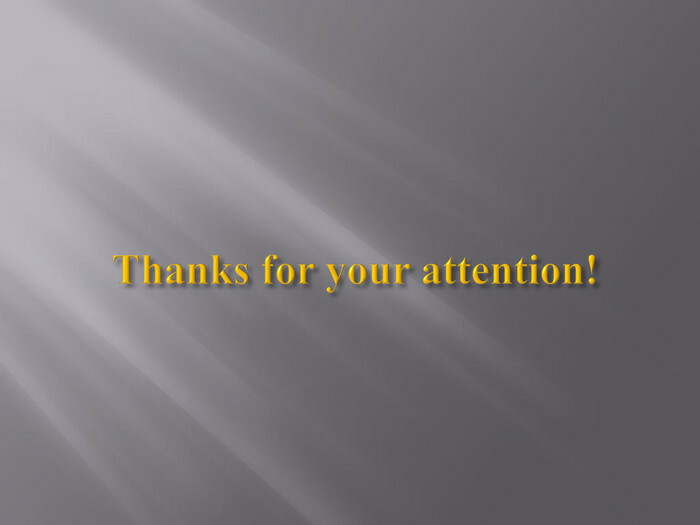 Sir Kay had no sword with him. When Arthur got to the churchyard, there was no one there. All the knights had gone to the contest to try their skill. Then Arthur, quickly and easily, pulled the sword out of the stone, and rode away to give it to his brother. Sir Ector saw the sword, he said to Arthur, "You are my king.” They went to the archbishop. 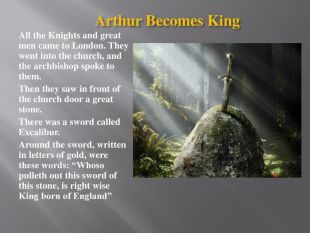 Then the archbishop called all the the knights and said, “Put the sword back into the stone.”Arthur did so… So Arthur became king. 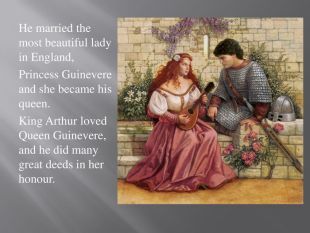 He married the most beautiful lady in England, Princess Guinevere and she became his queen. 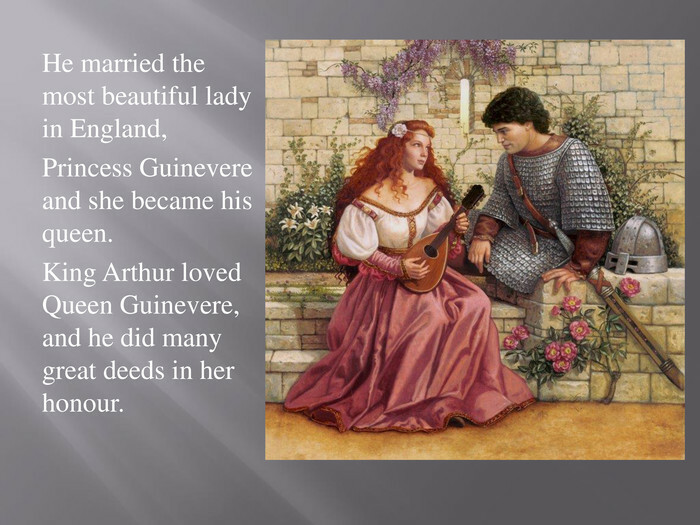 King Arthur loved Queen Guinevere, and he did many great deeds in her honour. The knights and the Round Table The Knights were men of courage, honor, dignity, courtesy, and nobleness. 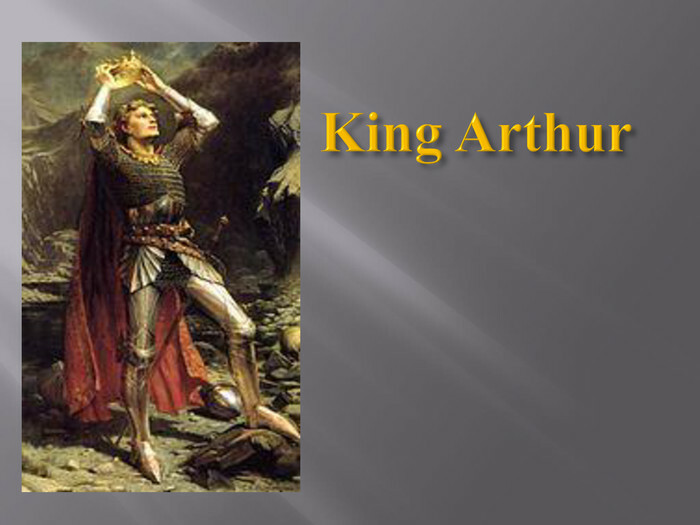 They protected ladies and damsels, honored and fought for kings, and undertook dangerous quests. 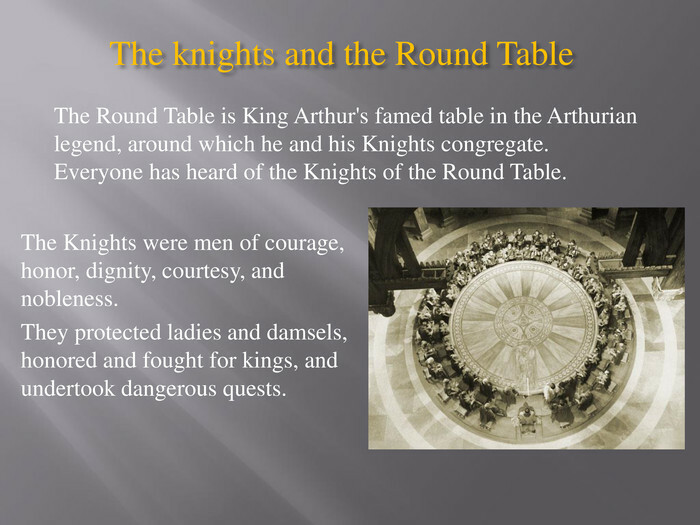 The Round Table is King Arthur's famed table in the Arthurian legend, around which he and his Knights congregate. Everyone has heard of the Knights of the Round Table. The knights were usually of noble birth: they were usually kings and princes, dukes, counts (or earls) and barons. 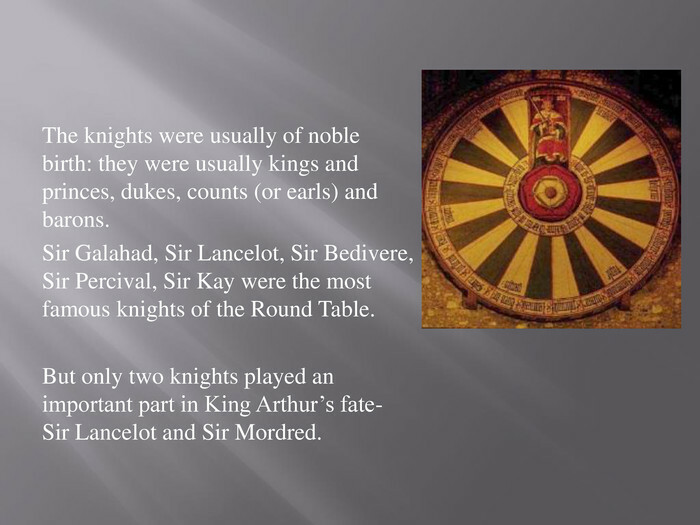 Sir Galahad, Sir Lancelot, Sir Bedivere, Sir Percival, Sir Kay were the most famous knights of the Round Table. 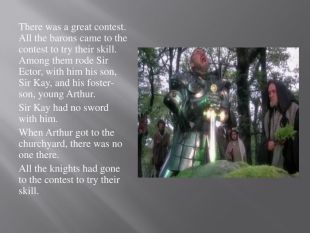 But only two knights played an important part in King Arthur’s fate- Sir Lancelot and Sir Mordred. 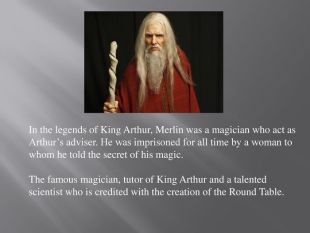 In the legends of King Arthur, Merlin was a magician who act as Arthur’s adviser. He was imprisoned for all time by a woman to whom he told the secret of his magic. The famous magician, tutor of King Arthur and a talented scientist who is credited with the creation of the Round Table. 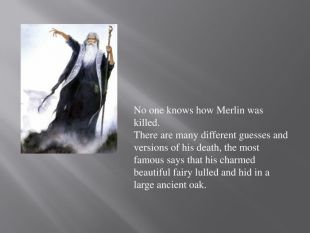 No one knows how Merlin was killed. 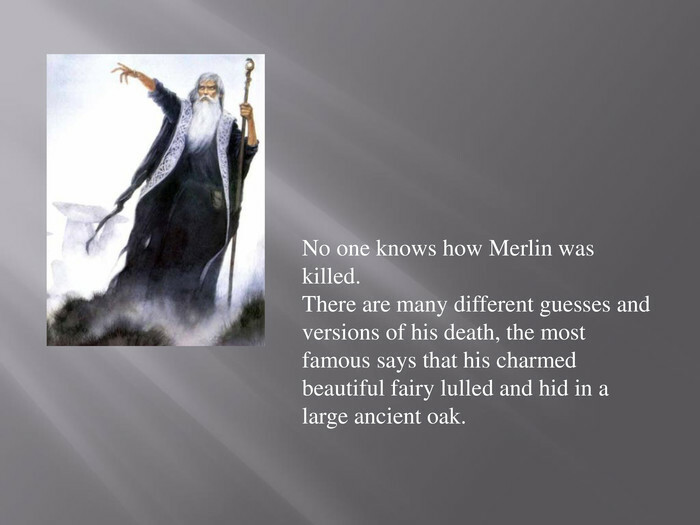 There are many different guesses and versions of his death, the most famous says that his charmed beautiful fairy lulled and hid in a large ancient oak. 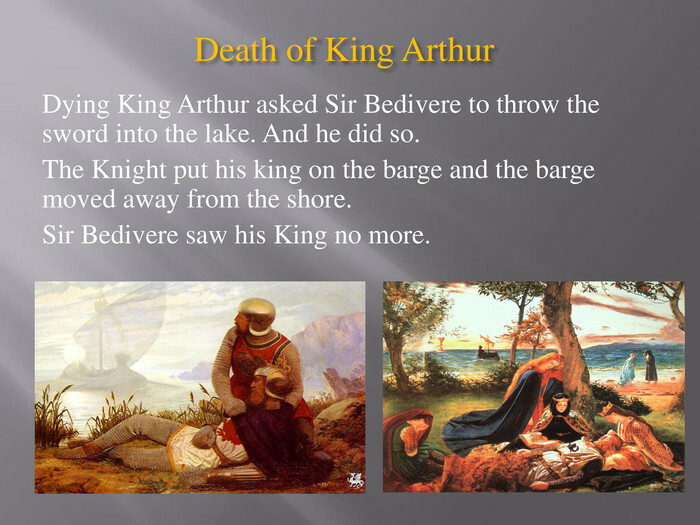 Death of King Arthur Dying King Arthur asked Sir Bedivere to throw the sword into the lake. And he did so. The Knight put his king on the barge and the barge moved away from the shore. Sir Bedivere saw his King no more. Some say that King Arthur lives still, with his knights and companions, in an enchanted castle, and that he will come again to rule. 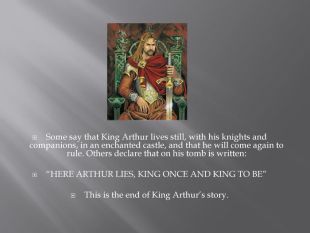 Others declare that on his tomb is written: “HERE ARTHUR LIES, KING ONCE AND KING TO BE”This is the end of King Arthur’s story. 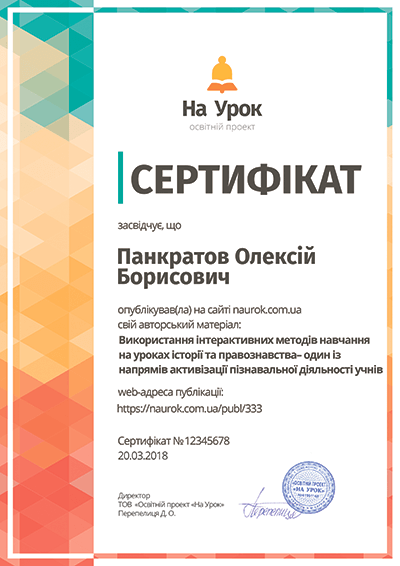 Контрольна робота 11 клас з граматики на тему "Сonditional sentences"